I must be overlooking the obvious but I cannot determine where my perordered BC3 game will be made available -- at my ORIGN account (the new EA member interface) or my EA store account (ea.com). I prepurchased the game through EA. I see BF3 listed in my Origin account list of MY GAMES (as unreleased), and assume that as of tomorrow I will see a new link here for downloading -- is this correct? I do not see any unlock code or other code in my online EA invoice for BF3 -- which is troubling. Download and install the Origin desktop app. The download button for BF3 is currently disabled. I assume this is my Origin desktop app. The Holy Grail can be seen in the lower left hand corner. Yes, thats the actual pre-order....the beta has nothing to do with that and is ran as a separate item. You will also get battlelog with the Beta as well.....that will be your server browser, stats, Voice, and friends list as well. The friends list carries over from origin to battlelog so you shouldn't have to add all the contacts twice. 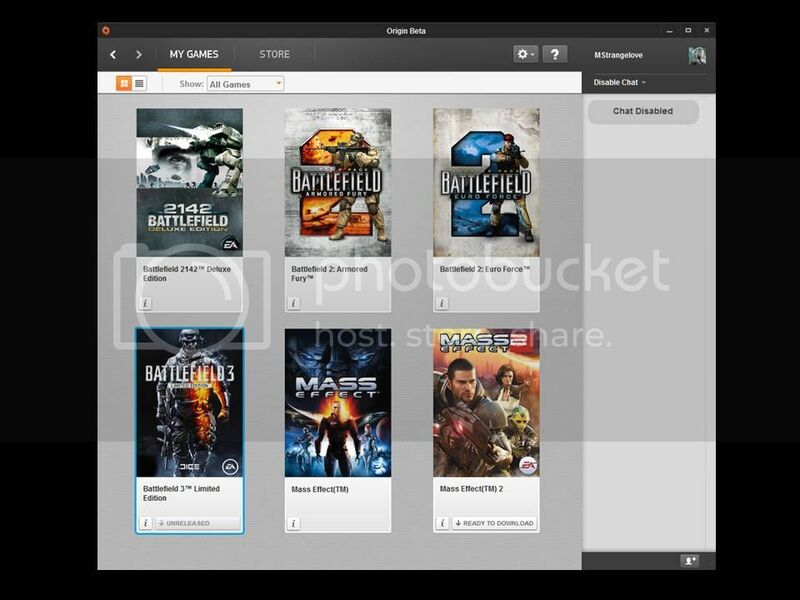 ON PC, IT WILL AUTOMATICALLY APPEAR IN THE ORIGIN APPLICATION'S FREE GAMES PAGE. ON PC, YOU FIRST INSTALL THE ORIGIN CLIENT (DIRECT DOWNLOAD, ~50MB: WWW.ORIGIN.COM/DOWNLOAD ) AND THEN INSTALL THE BETA FROM WITHIN THE ORIGIN CLIENT. MORE DETAILS WILL BE AVAILABLE HERE BEFORE THE BETA STARTS. FOR PC, ORIGIN WILL BE USED TO DISTRIBUTE THE BETA INSTALLATION AND RUN THE GAME AND THEREFORE NECESSARY TO PLAY. Presumably the email will have more detailed information though. It's supposed to show up under the free games directory. I'm assuming the one under the store tab. It may be too early, but there is no beta showing in my Origin desktop app. No email from EA. Yet the Origin desktop app gives NO indication of the fact that my purchase came with access to the Beta release. patience young grasshopper.....when the game arrives you must be one with the rifle. patience young grasshopper.....once the game arrives you must become one with the rifle.